There are no weeks off in the Eastern Kansas League (EKL). Despite suffering losses to open the season last week, defending 6A champion Blue Valley North and Blue Valley must try and rebound against each other in Week 2. The fact that both the Mustangs and Tigers remained in the Kpreps rankings this week should be indicative of the amount of respect our voters have for the competition in the EKL. Blue Valley North fell 33-21 to 4A No. 1 Bishop Miege, while Blue Valley dropped a 30-14 decision at 5A No. 2 St. Thomas Aquinas. Both teams feature experienced quarterbacks that will play at the next level. North’s Graham Mertz is one of the nation’s best and has committed to Wisconsin. Mertz passed for 317 yards and two scores, but was consistently pressured and threw two interceptions against Miege. Establishing a solid run game and limiting turnovers may be key to beating the Tigers. Meanwhile, Blue Valley’s Walker Kinney has gathered college attention as well, and more will likely come his way after another solid season. Kinney passed for 153 yards and a touchdown in the loss to Aquinas. Blue Valley trailed 21-14 at halftime, but couldn’t slow down the Saints’ ground game in the second half. While much of the Centennial League attention has been focused on Topeka High and Manhattan this week, a pair of other games will certainly have a big impact on ultimately deciding the league title. Junction City will travel to Washburn Rural in a battle of 1-0 teams. Last season, the Blue Jays beat Rural, 35-21. Washburn Rural escaped Emporia with a 28-24 road victory. The Junior Blues scored on a 13-yard touchdown pass from Jordan White to Jaylen Carter with less than 90 seconds remaining. The Rural defense then held the Spartans out of the end zone on four consecutive pass attempts to end the game. Expect White to be one of the top dual-threat quarterbacks in Class 6A after he missed most of last season with an injury. Against Emporia, White passed for 137 yards and added 93 yards on the ground. Junction City opened with a 56-31 shootout victory over Hays. Blue Jays led 21-17 at halftime, but opened up the game with back-to-back rushing touchdowns by sophomore Russell Wilkey and quarterback Rooster Adams. Wilkey led the Blue Jays with 218 rushing yards. Elsewhere, Topeka Hayden will take on Topeka Seaman in one of the most intense Centennial League rivalries. Both Hayden and Seaman opened the season with dominating wins. Hayden rolled past Topeka West, 55-3, while Seaman blasted Highland Park, 56-8. Seaman used eleven different ball carriers in totaling 281 yards rushing against the Scots. Sam Payne, Kobe Jones, and Christian Beauchamp each rushed for two touchdowns, while Blake Smith and Caeden Meredith ran for the other two scores for the Vikings. Hayden’s Brady Bohannon made a successful transition from linebacker to quarterback in rushing for two scores and passed for another in beating the Chargers. While Hayden has won six of the past ten meetings, Seaman has won two straight, holding Hayden to six total points in the past two seasons. Hesston returned one of the state’s best quarterbacks in Cameron Cox. He passed for 1,877 yards and rushed for 1,231 with 30 TDs accounted for last fall. However, coach Tyson Bauerle said Cox tore his MCL in the second week of practice and in a best case scenario is likely expected to miss at least several weeks. Cox was hurt on a helmet to the knee in a drill. He is expected to be assessed again next week. Junior Jacob Eilert, the backup quarterback last year and expected to be a starting wide receiver this fall, stepped in and played well in a 42-36 victory versus Hillsboro. He completed 9 of 14 passes for 126 yards and two scores. Bauerle has been pleased with Eilert’s preparation in the summer and at JV levels. Bauerle said Eilert has the intangibles and leadership to be a great quarterback. He has had a significant amount of quarterback reps at padded summer camps and has learned the offense. Eilert benefited from a strong supporting cast. Standout running back Parker Roth delivered 14 carries for 198 yards and four scores behind an experienced offensive line. Koehn, the starter at center since his sophomore year, is the most consistent lineman. A wrestler, Koehn is strong with his leverage. The athletic Duerksen has played guard and tackle and was the team’s best guard in the season opener. Hesston has consistently been one of the state’s most consistent teams – and especially offenses – in the last 13 years. The Swathers have no losing seasons since ’99. Hesston has averaged 36.8 points per game since the start of ’10 season and tallied at least 32.6 points every year. The Swathers are at Larned this week. The teams had never played before ’16. Hesston won the last two meetings 41-13 and 56-35. Larned fell, 46-7 to Smoky Valley in the season opener. Ellis County features four high schools in four different classifications – Ellis, Victoria, Hays High and Thomas More Prep (TMP). Friday features the one game a year where Ellis County schools play each other when Class 1A Ellis faces 2A TMP at Lewis Field Stadium. Both teams are 0-1 after Ellis lost to Phillipsburg and TMP to Smith Center. Both opponents are ranked No. 1 in their respective classes. In 2014, the rivalry resumed for the first time since 1953 and has been a very even matchup. The teams are 2-2 against each other and have alternated wins and losses. Ellis’s two victories have come by a combined 15 points, while TMP won 49-13 last year. Both teams switched their offenses some this year. TMP went from the pass-heavy spread under Jason Cauley to the triple option with David Bowen. Ellis has gone more spread with coach Craig Amrein. Class 1A La Crosse continues its new schedule this week. Last Friday, the Leopards opened with a 48-0 win against Ellinwood in an extremely rare 11-man Central Prairie League game. This week, the Leopards travel to 3A Russell, less than an hour away. It is widely considered to be the first time the schools have ever played each other. Russell opened the Jordan Echer era by moving its home game to Great Bend because of a power outage in the City of Russell. This was supposed to be the first of three straight home games. The Broncos won 24-13 against Ellsworth. Russell threw for 179 yards with two quarterbacks and had just 84 rushing yards. However, Russell, like last year, greatly benefited from turnover creation. Russell forced three turnovers and had a pick-six. Last year, Russell went 4-5, its best record since a 4-5 mark in 2010. Russell has not opened 2-0 since a 3-6 season in ’04. After an 0-2 start last year, La Crosse is 7-1 in its last eight regular season contests. Last week, La Crosse, without senior running back Christian Suppes for the year, had big games from non-seniors. All of the offensive production came from non-seniors. Junior Blake Herrman had eight catches for 89 yards and two scores. Junior Keldon Day collected 13 carries for 131 yards and two scores. Junior Hunter Morgan had 93 passing yards and two TDs, while freshman Colby Stull had 102 rushing yards. All but two of the 61 tackles came from non-seniors. Week 2 features a bevy of important eight-man contests. In Division I, fourth-ranked Hodgeman County opened with a 38-12 road win against Dighton. The Longhorns, the defending Division II runner-up, make the one-way 126-mile trip southeast to Medicine Lodge, a newcomer to eight-man football. Medicine Lodge reached the Class 2-1A playoffs last year. The Indians opened with a 60-14 road win versus struggling St. John. In the last several years, Hodgeman County has played very well in long road trips and against new eight-man teams. Since the start of the ’16 season, Hodgeman County is 16-7 overall, 8-3 at home and 8-4 in road/neutral games. However, the Longhorns are 5-1 in road trips that exceed over 100 miles one way. The only loss was a 54-48 state title game loss to Hanover at Newton’s Fischer Field (153 miles). The long road trips also include several quality wins, including 59-14 at Almena-Northern Valley (136 miles) in the first round of the playoffs last season. Additionally, Hodgeman County made the 166-mile trip to Wallace County for a key 27-6 district win, along win long road trip victories versus Tribune-Greeley County (60-14), Triplains-Brewster (60-14) and Leoti-Wichita County (46-0). While just 85 miles one way, Hodgeman County also defeated Coldwater-South Central, 30-27, last fall in non-district. South Central finished 9-2 and was the third-best defense in the eight-man ranks. The Leoti win opened the 2016 season and marked the Indians’ first eight-man game. Additionally, the Longhorns beat Satanta, 48-0, in ’14 and 50-0 in ’15. Satanta was a relative newcomer to eight-man with its last year of 11-man football coming in 2011. Medicine Lodge went 4-6 last fall and averaged 19.6 points a game, while allowing 38.4. The Indians have 28 players on their roster, including nine seniors, led by senior quarterback Garrett Burden. The Salmans brothers paced the Longhorns. Sophomore Isaac took over for his older brother Jacob and completed 6 of 7 passes for 56 yards with one touchdown against zero interceptions. Junior Eli rushed 22 times for 123 yards and two scores. 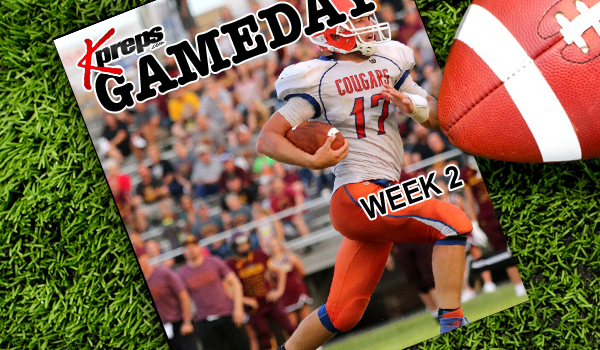 In another key Division I matchup, Spearville travels to Coldwater. The Lancers, with new coach Travis Callaway, opened with a big 52-6 win versus Satanta, a 7-2 team last fall. South Central defeated Bucklin, 51-6. Spearville has not lost a regular season contest since a 38-14 defeat versus Hodgeman County in Week 5 of the 2013 season. South Central is 41-12 since the start of the ’13 season, while Spearville is 54-5 in the same stretch. The only matchups since ’11 have come in ’14-15 when the Lancers won both games by the 45-point margin. However, this has historically been a close series. Quarterback Kolby Stein leads the Spearville offense as a returning starter. South Central, with its variety of offensive looks, had three carries for 52 yards and a score from senior Ethan Jellison in a balanced effort. District Play begins in 8-Man, Division II? Yes, already! It’s hard to believe we could be starting to sort out the playoff picture in Week 2, but believe it or not, district play does begin for most 8-Man, Division II (8M-II) teams this week. Eight-man, Division I (8M-I) is made up of 48 total teams divided equally into eight, six-team districts. That means that each team plays five district games that begin in Week 4. In last week’s Game Day feature, we listed some of the state’s longest winning and losing streaks. While Bishop Miege and Hanover each extended the state’s longest current winning streak to 26 games, we had eleven teams ended double-digit losing streaks in Week One. In fact, nine of the 33 teams that entered this season on double-digit losing streaks won their opener last week. Most notably, Southeast-Cherokee snapped a 28-game losing streak with a 20-6 win over Uniontown. Southeast, in its first season in the Three Rivers League, had not won since defeating Northeast-Arma, 27-20, back on October 10, 2014. Last Thursday night, Wichita North defeated Wichita South 29-22 to snap a 21-game losing streak. The Redskins got a big night from Joe Williams, III who had 300 yards rushing. Prior to that victory, Wichita North last won on October 15, 2015. In addition to Southeast-Cherokee and Wichita North, the following schools also broke double-digit losing streaks in Week 1: Atchison County (19), Salina Central (18), Valley Falls (17), Triplains-Brewster (11), Inman (10), Gardner-Edgerton (10), and Washington County (10).